The Phoenix residence that Frank Lloyd Wright designed for his son is back on the market, because funding to support its donation to the School of Architecture at Taliesin fell through. 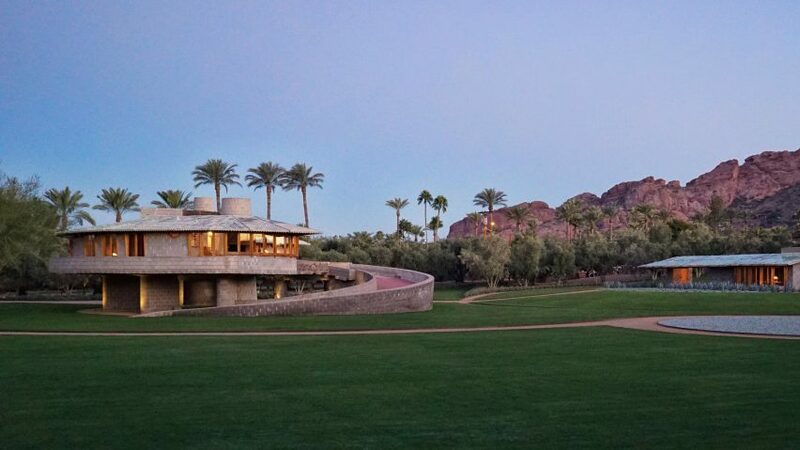 David and Gladys Wright House owner Zach Rawling has listed the spiralling property in the Arizona city's Arcadia neighbourhood for nearly $13 million (£10 million), after coming to a "mutual agreement" to end a collaboration with the School of Architecture at Taliesin. Rawling gifted the structure to the school in summer 2017 – bringing an end to years of speculation about its fate, which included plans for its demolition – on the condition of raising $7 million (£5.4 million) in endowment funds by 31 December 2020. The House and the school teamed up to create a joint fundraising organisation called the David Wright House Collaborative Fund. But, after only one year, Rawling and the school's dean, Aaron Betsky, decided that this goal, and working together, is unachievable. "Over the past year, we have learned that the fundraising timetables of both parties do not lend themselves to a joint campaign," Rawling and Betsky said in a joint statement posted on the David and Gladys Wright House website. The David Wright House Collaborative Fund will now be dissolved, and proceeds already raised will go to the school. "Frank Lloyd Wright remains America's greatest architect"
Among the main concerns for the project, as highlighted in the statement, is that the funds were intended to be used for repairs and maintenance of the 66-year-old residence. This was highlighted as a potential financial drain on the School of Architecture at Taliesin, which instead will continue to raise money for its own endowment. "With the school in its fledgling years, the prevailing thought was that the divergent donor interests would effectively divide its support base rather than enhance it," said the statement. "Uncertainty regarding future capital improvements at the House and the long-term cultural development of the site in Phoenix increased this concern," it continued, adding that the school and house "will continue as friends, architectural enthusiasts, and supporters of the cultural community". Wright, one of the 20th century's most important architects, designed the concrete-block residence for his son and daughter-in-law. The property is elevated above ground, and accessed via a spiralling ramp that continues up onto the roof, much like the architect's iconic Guggenheim museum in New York. Following its completion in 1952, it was used as a family home until it was left abandoned 2008, starting a decade of uncertainty about its future. Developers threatened to demolish the building in 2012, but Rawling stepped in and bought the property with plans to turn it into a museum. This idea was met with strong opposition from neighbouring residents, who feared that too many visitors would spoil one of Phoenix's most exclusive addresses. In June 2017, Rawling revealed that the property would become a part of the architecture school, based for part of the year at the Wright-designed Taliesin West compound in nearby Scottsdale. The school was founded by the architect in 1932 as an apprenticeship for a small number of students, and was known as the Frank Lloyd Wright School of Architecture until a rebranding effort last year. The David and Gladys Wright House would have provided an additional teaching space for the institution, along with the Taliesin estate in Wisconsin, where the school currently offers an accredited Master of Architecture graduate programme based on Wright's architectural principles. As the future of the property once again remains uncertain, the Frank Lloyd Wright Foundation has commended Rawling on making "great strides in raising awareness of and appreciation for the house", and called for the future owner to similarly "embrace its history". "All of Wright's buildings are treasures that teach us how to build better and live more beautiful lives, and it is our hope that all Wright sites end up in the hands of good stewards who will preserve both the buildings and the ideas they advance," said the organisation's president Stuart Graff in a statement. "Wright's legacy is inextricably linked to Arizona, and this house that he called 'How to Live in the Southwest', is an integral part of that story," he added. "We hope the next owner of the home will embrace this history, and we look forward to working together in partnership to preserve the Frank Lloyd Wright legacy to inspire future generations to build better and live better." The news of the property listing follows concerns for the future of other Wright buildings, which have grown since the architect's Lockridge Medical Clinic in Montana was bulldozed earlier this year. The medical centre marked the first of his intact buildings to be demolished since the Francisco Terrace apartment building in Chicago, and Munkwitz Apartments in Milwaukee, were destroyed in 1974.